Last Tues I was on Danny Watson’s show on Newstalk ZB – new products / bright ideas. Danny has this session on the first Tues of each month, & it’s fascinating what NZers are up to! I’ve had some calls & quite a few orders for the game, Cloak of Protection. So a big thankyou to Danny. Danny thought that ‘the images were so fantastic you could put the cards on the wall’. Here’s one that caught his eye in the (black & white) book that comes with the game. Adzebill. 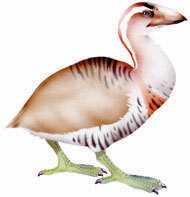 Adzebill were 80cm tall, flightless, rail-like birds. Their massive down-curved bills were probably used to capture animal prey as large as ducks. Giant flightless birds, chasing huge flightless ducks. Must have been quite a sight!!! As you know, our major retailing drive is through Wellington Enviroschools. They emerged as the most aligned organisation in terms of its kaupapa and the integrity of the game. But also, in the Wellington region, we have a retailer who is also aligned to our core values. Commonsense Organics. Several years ago Morgan & I made giant pohutukawa for the Commonsense Organic stores in Kapiti & Central Wellington. Kapiti now have theirs up all year round: Wellington put theirs up for xmas. Now, in the Kapiti store, the games are sitting on the counter, beneath the pohutukawa. There they’re storming out the door!!! Games can also be found in Commonsense Organics stores in Lower Hutt, Wellington & Kilbirnie (both later this week). Also in Kilbirnie we are in the fabulous Children’s Bookshop. Today we had a very special, and fun visit from Card game designer Jil Hemming. Jil has created a game called ‘Cloak of Protection’. This game is a superbly exciting card game which challenges and educates children as well as builds strategic and problem solving skills. The aim of the game is to build your own cloak, made up of birds from four different realms – the forest, the sky, the earth and the underworld (extinct). The game really was awesome – for all ages and abilities. The whole class got so excited and competitive – what a great buzz!!! Today I’m at Muritai School teaching the game to a class. As they want to promote it – at their carnival – this coming weekend. I’m always happy to go into a school & teach Cloak of Protection. Hopefully – as the teaching, learning & sales network, with Enviroschool Wellington, gets going – students all over, will be teaching others too. Cloak of Protection is simple enough to learn. But as you pick up strategies, it becomes quite fierce! This way of marketing is new. Instead of a retail space taking their cut – the rewards go back into the Enviroschool Progamme at each school. Schools earn – among other things – extra games, and cash rewards. For early games the schools gets $5 per game – but the amount increases dramatically as sales go up! One school, Otari, is sitting on 9 games sold, and when one more game sells they will have reached their first point band. I have a brand new cheque book sitting here, ready to send them their reward package! Meanwhile, Kapiti Island, has won something huge – it’s been declared free from stoats. It was. Then it wasn’t. Now it is again. The island is offshore my beach – Waikanae. Close by, and really accessible. But we never thought a stoat could travel there too. The best guess about how one got there, is by floating on a log. Female kits are pregnant before they leave the (feather-lined) den – so it’s like a whole family arriving in one! The forest birds who live there, will again thrive. Stoat and ship rat are the big time forest silencers. In the game over half of our forest birds get eaten by the stoat. Just as well players of the game have gods for their protection. And just as well the island has humans for its protection. Massive undertaking – well done DOC!! Thankyou for keeping the cloak alive. Had a fabulous time at the Kids Connect hui, Hutt City, last Tues. Students, years 5-8, were there from many of the Hutt schools. In the morning I was part of a discussion group. Students shared all the fabulous things they were doing to look after our plants & animals. Then in the afternoon we played Cloak of Protection. We had groups of 8-10 students for 15 minutes a rotation. My friend Elizabeth & I taught the game on speed!! But all the groups got to trade and feel the impact of our predators. The next day, I heard that some students were back at their schools playing the game – cool! It was great to meet students & teachers, and to start 13 new schools on the enviroschools teaching, learning & sales network. Meanwhile Gordon & Ann, of Kapiti Boardgamers, were in Hamilton this last weekend – playing games. They’ve taken Cloak of Protection to play with the Hamilton folks + they’ll be testing Gordon’s new role-playing game about saving the ocean. We played it last weekend & we all lost – we weren’t sure whether to blame the CEO of the company, or if it was the lack of a green person to fight more strongly for the environment. But down went our eco-system. I was a beach-walker, and, as the beach got lost & saved & lost again, I had to walk around the city. I would SO miss Waikanae beach. Me (walking and collecting), dogs (chasing sticks & seagulls), & families (splashing in the water / net fishing on the beach). In Cloak of Protection, the dog is a predator. Attracted by the strong smell of brown kiwi, one dog can do a lot of damage – some kill hundreds!! Even adult kiwi are easily found and crushed by dogs. SO we know to be careful where dogs are allowed to run free. Once – the kuri dogs (they arrived with the Polynesian settlers about 1280AD) – were fed mostly on fish – not from the beach, so much, but from scavenging around camps. Tomorrow we’re at the Kids Connect hui in Hutt City. There we get to play the game with a lot more schools, including 13 more enviroschools. Look out for their names & comments tomorrow, under the tab ‘Enviroschools’. And please keep those sales coming in. One school, Otari School, only need one more sale to get their first reward – good going! Meanwhile here are some of my first illustrations for the cards. As all game designers must do to get started – I made my own. The card was from cereal packets, and the coloured papers were from around the house. It was fun! I’ve had some really interesting conversations about details in the booklet How the Game was Created. This booklet was put together by Chriss at Expressions Gallery, to go alongside the exhibition of Morgan’s illustrations. Here are some early illustrations done by my friend Ruth Blair. I drew the outlines, and she put the colour in, using a technique that she was using for short films at the time. I took these cards to Raumati South school and played it lunchtimes with years 5&6. Kids followed me begging to play – they loved the trading aspect of the game. But some cards they loved SO much, they wouldn’t trade them for anything!! People still respond really positively to these images – they’re very powerful. But it still took four more years before the game was finished. Here is a view of the new box, which is for retail stores. The aim is to have them in selected stores this summer. Getting a better box was a steep learning curve for me! I spent hours with Gordon & Ann, of Kapiti Boardgamers, looking at the boxes of their very-very many games and discussing what makes a good box. We reckon the cover of this box is now a great reflection of what’s inside. We’ve had the game in various retail stores this store. The sales results have been surprising. Not bird sanctuaries, nor zoos, nor Department of Conservation stores. But galleries, design stores, children’s bookshops. . . SO if you have any suggestions about a great store in New Zealand, where you think the game should be, then please let me know. Use the contact us page & send me their details. I’ll follow them up & let you know the result! We’re already in 10 stores, and only want to be in about 60 more. Shouldn’t be too hard – not with your help. Thanks for this – thanks a lot. In the 9 months we’ve had the game on the market, we’ve had extra-ordinary support from galleries in the greater Wellington region. The Mahara Gallery, Waikanae, launched us + had an exhibition of Morgan’s outstanding illustrations for the game. Now the same exhibition is on at Expressions Gallery in Upper Hutt. They’ve made up an amazing booklet ‘how the game was created‘, which shows the steps I took (over nine years). And we’re playing the game! This Wednesday 3, Thursday 4, and next Thursday 11 October. If you’re any where near Expressions, please pop in and join us in playing the game OR come see Morgan’s exhibition – running until Sunday 11 Nov.
A BIG thankyou, from both Morgan & myself, to the Mahara & to the Expressions Gallery. Your support has been essential. This Wednesday, 26 Sept, sees the launch a partnership between Enviroschools Wellington and the Cloak of Protection game. Spreading the Cloak: a joint teaching, learning and selling network. This partnership gives enviroschools a fundraising, awareness-raising, and student empowerment opportunity. And for Kakariki Games, enviroschools have emerged as the most aligned organisation in terms of its kaupapa and the integrity of the game. Every school enrolled receives an initial game as a gift, has a page on our web-site, and will be invited to attend regional game play-offs (starting next year). On the day Waikanae-based enviroschool Kapanui School will help launch the partnership, and you will see some new pages on our site. The enviroschools page will take you to the schools currently enrolled. On their page you will be able to see information about each of them, reward points earned, and their feedback about the game. Anyone purchasing a game (via the site) can choose which school to reward. This sales method will be exclusive to Enviroschools. To find out about the schools, the reward system, and to read student posts about how the day went, have a look later this Wednesday.